It’s that time of the year again when Christmas carols, nativity concerts, tinsel and fairy lights are everywhere you look, not to mention the christmas pudding, cookies, mince pies and other delicious festive season food we get to prepare and eat. This year, instead of a traditional fruity cake, I decided to experiment with a layered vanilla cake – here’s the recipe in case you’d like to try it yourself. 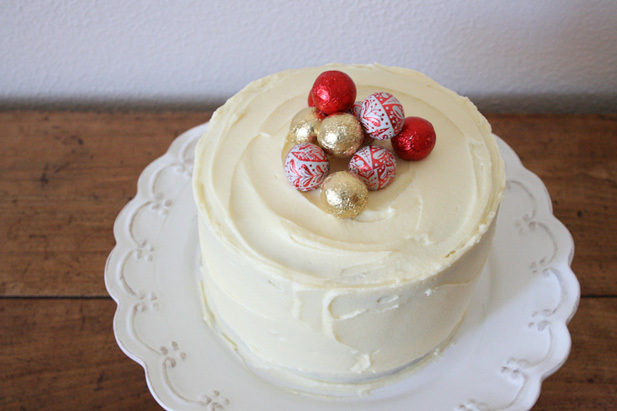 Everybody loves vanilla cake, right? 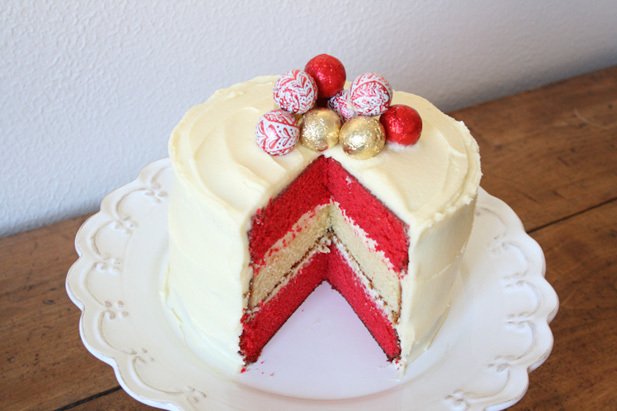 I opted for three layers – two bright red for some festive cheer – and iced the cake in classic vanilla buttercream. 2. 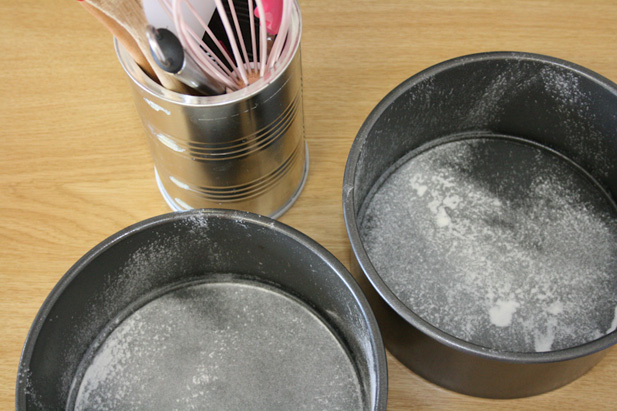 Grease and flour your cake tins. 3. In a nice, big mixing bowl, cream the butter with an electric mixer until it is smooth. 4. Add the sugar gradually and beat until the mixture is fluffy and light in colour (about 2 minutes). 5. Add the eggs, one at a time, mixing thoroughly after each one. Also add the vanilla extract. 6. Add the dry ingredients (flour, baking powder and salt) in three parts, alternating with the milk. 7. Divide your batter into three equal parts, spooning each third into it’s own bowl. A kitchen scale might help you portion these three amounts equally. 8. 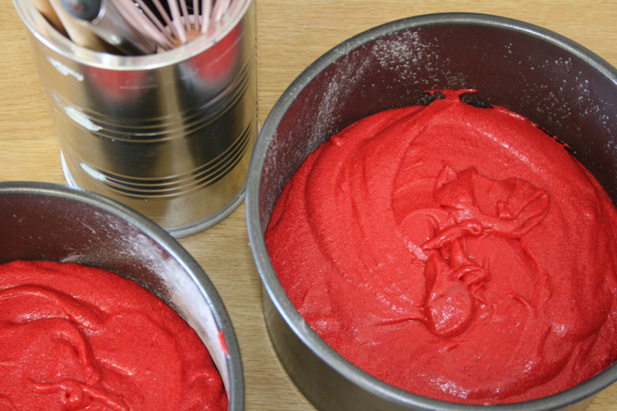 Colour two of the bowls of batter red, using the food colouring. This is done by simply adding food colouring until the mixture is bright red in colour. Start slowly though, red colouring is quite intense. 9. Now spoon your batter into the three cake pans and bake for about 30 minutes each, or until a cake tester comes out clean. 10. While the cake is in the oven, you can use the time to make your buttercream icing (see recipe below). 1. Cream the butter with an electric mixer until smooth. 2. Slowly add three cups of icing sugar, followed by the milk. 3. Add the rest of the icing sugar and mix thoroughly. 4. Add more milk if the icing is too thick. 1. Leave the cake to cool in the pans for about 30 minutes. Then gently turn the layers out onto a cooling rack. 2. Wrap the layers in plastic cling film and chill in the freezer for another 20 minutes to an hour. This may sound strange but it will make the cake easier to ice. 3. If your cake layers have ‘domes’ on top, gently slice these off with a bread knife, so your layers fit perfectly on top of one another. 4. Now carefully stack the cakes (on your revolving cake stand if you have one), with a generous layer of buttercream in between them. 5. Roughly coat your cake in a thin layer of buttercream to seal in the crumbs. This is called crumb-coating. 6. Place the cake in the fridge for about 15 minutes, so that the buttercream sets. 7. 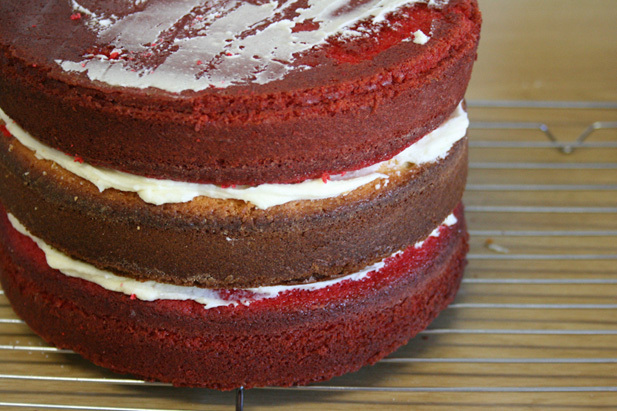 Finally you can add the outer layer of buttercream, taking time to smooth the buttercream over. 8. Decorate however you wish! 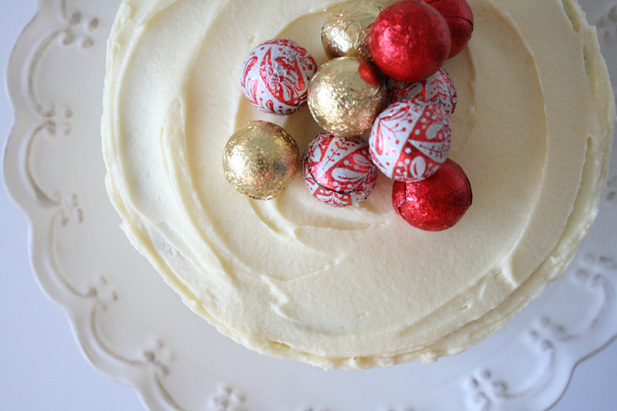 I used chocolate balls covered in Christmas foil. Happy festive season to you fellow bakers. Don’t get sunburnt and enjoy your Christmas cake.